We've reached another big minigolf milestone - the 800th course visit on the Crazy World of Minigolf Tour. In September 2006 Emily and I began what would become our epic quest to visit every miniature golf course in the UK. Back then there were approximately 600 courses. The game is booming in the UK and our friends in Sweden are also experiencing the rise in popularity. 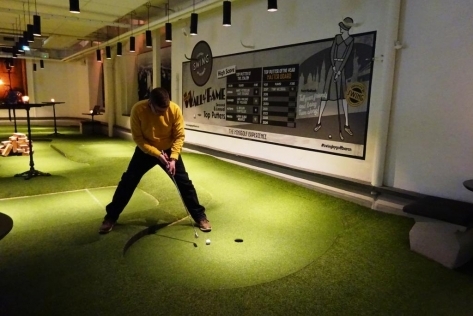 Our 800th course visit was to the Swing by Golfbaren indoor minigolf course and speakeasy in Stockholm. Swing by Golfbaren recently celebrated its first anniversary and our friend, minigolf rival and legend of the sport Hans Olofsson invited us to be guests at the party. We had a marvellous time and must say Swing by Golfbaren is one of the best minigolf venues we've visited. The course has a 1920's theme and is a truly unique layout. There's an 'upstairs' 12-holes open for all to play, while hidden 'downstairs' are a further 6-holes which can be booked for private events. Throughout the venue you can find out about the history of miniature golf, with displays, ephemera, stories and memorabilia from the late 1800's to the modern era. Check out the Swing by Golfbaren website and the blog post from our visit for more info. While in Sweden we managed to visit nine courses in 42 hours. Since our return we've visited more courses in Chicago, USA and Altrincham, Greater Manchester. Richard Gottfried blogs about minigolf at the Ham and Egger Files. He's also the Curator of the Crazy Golf Museum and author of The Minigolfer's Guide to Marketing.